Points Nécessaires : 3800 Software is not compatible with mobile and tablet devices. Please add this title to your Wish List and sign on to your the first club account from a desktop computer to complete your redemption. ABOUT THE SOFTWARECrayola® Photo FX Studio - Edit Notes with Graphics and Digital Arts ToolsCrayola® Photo FX Studio provides easy to use tools to edit digital photographs and add fun special effects including coloring, lightening, darkening, sharpening, and smearing.KEY FEATURES Five realistic art tools simulating real art media for touch and pressure-sensitive drawing and enabled for touch sc… reens Hundreds of pre-set colors or mix unique colors on digital palettes Hundreds of art images and templates to customize photos or create greeting cards, invitations, planners, calendars, and more! Import any standard digital file Export in standard file formats for use in other programs Learn digital art and photo-editing technique with fun activities in the Activity Guide Quickly learn the program features with an animated Program TourSYSTEM REQUIREMENTS Children learn digital art and computer skills. 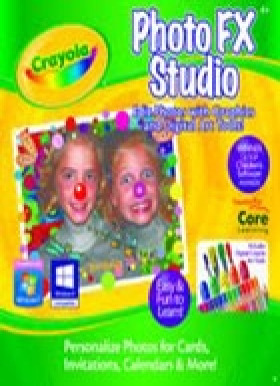 The program is a complement to the award-winning Crayola® Art Studio. OS:Windows 8, 7, Windows Vista, and XP.